Vasant Panchmi is a Hindu festival celebrating Saraswati, the Goddess of Knowledge, Music and Art. It is celebrated every year on the Fifth Day of the Indian month of Maagh – that is January-February. 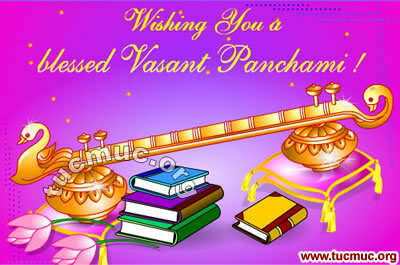 Magh Sud 5th day of the bright fortnight of the lunar month of Magh is the day of Vasant Panchami. Hindus all over the world celebrate this festival with great enthusiasm. Vasant Panchami is also known as Saraswati Puja Day. It is believed that this day is Saraswati’s Jayanti. Hindu temples are full of activities on this day. Hinduism has taken into account special significance of seasons and interwoven that with religious festivals e.g., Makar Sankranti, Vasant Panchami etc. People generally feel inclined to worship the presiding deity of the family Ishta Devata, or Devi according to the individual’s faith and desires. Vasant Panchmi marks the first faint sign of Spring. During this festival children are taught their first words; as it is considered an auspicious day to begin a child’s education. Brahmins are fed; and Pitri Tarpan is also performed. Most educational institutions organize special prayer to Sarasvati on this day. The colour Yellow also plays an important role in this festival, in that people usually wear yellow garments. Vasant Panchmi is also the time when planting of the Holika is performed and preparations for the Holi festival begins. This year Vasant Panchmi and Sarasvati Jayanti will be observed on Sunday 21 st January and Holi will be observed on Friday 2 nd of March. Basant Panchmi has a specific meaning. Basant means Spring, whereas Panchmi means the fifth day of Spring. It falls on Panchmi on the Shukla Paksh, the bright half in the month of Magh which is January/February. The festival is celebrated with young girls dressed in the diverse shades of yellow, magnify the splendour of nature and is being observed with vigour and festivity to mark the end of the long Winter months. It is one of the first Hindu festivals of the year and is celebrated all over India and wherever Hindus are domiciled. The Yellow colour has great significance, people wear yellow clothes, offer yellow flowers in worship, and put a yellow turmeric Tilak on their forehead reflecting the beauty of nature and the harvesting of the spring crop. The yellow flowers of mustard crop covers the entire field in such a way that it seems as if gold is spread over the land glittering with the rays of the sun. 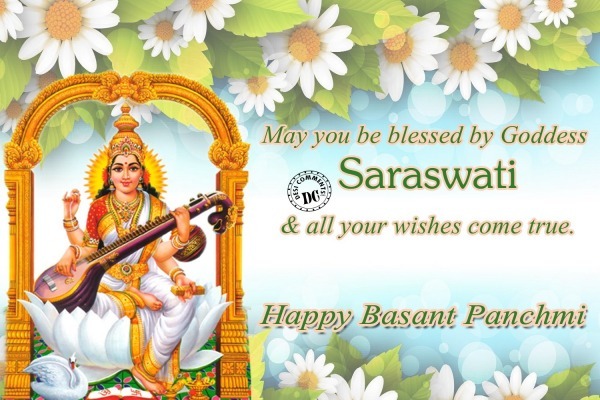 The day of Basant Panchmi is dedicated to Goddess Sarasvati. Sarasvati is the goddess of learning who bequeaths the greatest wealth to humanity, the wealth of knowledge. As “Divali” the festival of lights is to Lakshmi, goddess of wealth, and “Navratri” is to Durga, goddess of strength, courage might and and power, Vasant Panchmi is to Sarasvati, the goddess of knowledge and learning. Hindus celebrate this festival with great enthusiasm and temples and households are full of activities on this day. In almost every school in India children participate in worship and prayers to Sarasvati – the Goddess of knowledge and Art. So the most significant aspect of this day is that Hindu children are taught reading and writing their first words, and those who are already in school placed their books, pen and all other school related materials at the Altar of Mother Sarasvati to be blessed with a bright intellect and to be successful at Exams. Basant Panchmi is a festival full of religious, seasonal and social significance and is celebrated by Hindus all over the world with verve and a new sense of optimism. The first faint signals of the forthcoming festival of Holi – the festival of colours, also manifest at Vasant Panchmi. Meaning: May Goddess Saraswati, who is fair like the jasmine-colored moon, and whose pure white garland is like frosty dew drops; who is adorned in radiant white attire, on whose beautiful arm rests the Veena, and whose throne is a white lotus; who is surrounded and respected by the Gods, protect me. May you fully remove my lethargy, sluggishness, and ignorance.” I humbly bow to Maa Saraswati on Vasant Panchami.